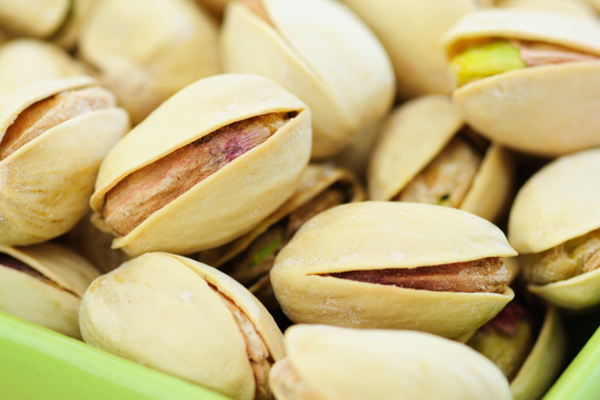 Those who ate in-shell pistachios consumed 41% fewer calories. Pistachio nuts have captured the attention of scientists, having been featured in four recent studies examining the dietary benefits of this food. One report involved 117 persons with type 2 diabetes assigned to one of three treatments for three months to assess the effect of mixed-nut consumption as a source of vegetable fat on serum lipids and hemoglobin (Hb)A1c. Supplementation was provided as 475 kcal per 2,000-kcal diet in the form of 75 g/day of mixed nuts (including pistachios), muffins or half-portions of both. Full-nut dose (mean intake 73 g/day) reduced HbA1c by 0.21% absolute HbA1c units, whereas no change was seen after muffin or half-nut dose. LDL decreased significantly after full-nut dose compared with muffin; LDL reduction after half-nut dose was intermediate and not significantly different from the other treatments. Additional research conducted by the U.S. Department of Agriculture and presented online in the British Journal of Nutrition focused on the fat found in pistachios. David J. Baer, PhD, and colleagues learned that pistachio fat may not be completely absorbed by the body, indicating that this snack may actually contain fewer calories per serving than originally thought. They determined that a 30 g serving contains 160 calories — 5.9% lower than previous calculations. Pistachio consumption also lowered LDL by 6% but did not significantly change total plasma cholesterol or HDL. Two other pistachio studies appearing in the journal Appetite found that people who ate in-shell pistachios consumed 41% fewer calories than those eating the shelled version, and pistachio shells can provide important visual cues as a reminder of consumption that translate to reduced-calorie consumption. Baer DJ et al. British Journal of Nutrition. 2011;doi:10.1017/S0007114511002649. Honselman CS et al. Appetite. 2011;57:414-417. Jenkins DJA et al. Diabetes Care. 2011;34:1706-1711. Kennedy-Hagan K et al. Appetite. 2011;57:418-420.